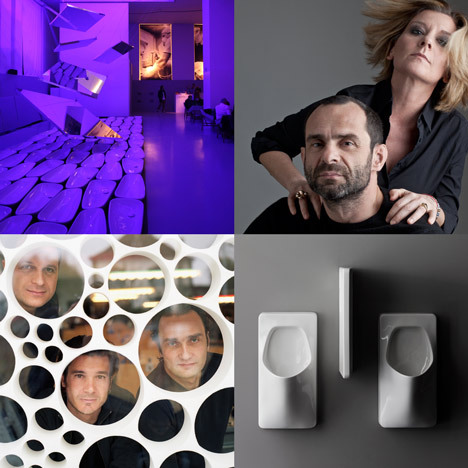 Dezeen promotion: in this podcast recorded in Milan, Aurel Aebi of multidisciplinary design practice atelier oï describes the scenography they created for Swiss bathroom brand Laufen, while designers Roberto Palomba and Toan Nguyen talk about their latest products. For the first time ever, and coinciding with the brand's 120th anniversary, Laufen had a presence as part of the Fuorisalone that takes place around the city during the Salone Internazionale del Mobile in Milan. Above portrait of Ludovica and Roberto Palomba is by Carlo Ciraudo & Max Majola. Portrait of atelier oï is by Friederike Baetcke. All other images are courtesy of Laufen unless stated otherwise. The two natural elements used in ceramic production – water and fire – were celebrated in a scenography that combined light, sound and movement. Water dripping across the surfaces of a series of suspended mirrors was captured in an array of fluid washbasins, while a minimal soundtrack created a tranquil atmosphere. On the opposite side of the space, a shimmering projection illuminated a linear display of products showing the different stages ceramic goes through from its raw state to the final glazed and fired finish. Large images on either end wall highlighted the craftsmanship involved in creating Laufen products and a set of vertical rotating mirrors helped unite the different elements within the space. Meanwhile, several new additions to the award-winning Palomba Collection by Milan design duo Ludovica and Roberto Palomba were launched at Laufen's stand in the fiera. The asymmetrical form of the new bathtub has been designed to provide ergonomic support, while the seamless surfaces of the floorstanding washbasin recall a rock that has been shaped by the tide. Additional products including washbasin bowls and storage units follow the design language of the existing Palomba Collection, ensuring visual consistency across the range. Photos of the Palomba Collection are courtesy of Laufen/Adriano Brusaferri. Also launched at this year's fair were the Antero urinal and Cinto divider by French designer Toan Nguyen. The urinal's large rectangular base plate makes it suitable for architectural installations and helps to cover previous fittings if used in renovation projects, while the curve of the bowl gives the product a more intimate feel. In a previous podcast recorded during an architectural tour of Switzerland organised by Laufen, leading Swiss architects described their recent projects and discussed the current state of Swiss architecture. It is the first time, atelier oï has created an installation for Laufen Bathrooms, that will be shown in Milan, in the Officine Stendhal, at the heart of the Zona Tortona. Aimed at showcasing the brand’s expertise, atelier oï has created an installation that interprets the transformation of the material. Two fundamental natural elements are involved in ceramic production: water and fire. Intimately related, these two elements are showcased by a play of moving mirrors. Facing one another, they change our perception of space while abstractly evoking the transformation of the material, and the creation of the finished product. A physical presence in the installation, water symbolises the cycle of nature in a vertical choreography, from the air to the earth, where, drop-by-drop, the passage of water is celebrated in a visual and acoustic choreography. This soft stream is captured in a series of 120 fluidly contoured basins, their shape recalling a stone polished by the current of a river, and at the same time celebrating the brand’s 120 year history. Opposite, different stages in the transformation from earth to ceramic are staged in front of a projection evocative of fire, and become intermingled with the orchestrated sweep of the moving mirrors. Large images on glass partitions intersperse the installation and highlight the importance of craftsmanship, vital to production and unique signature of the expertise of the Swiss brand Laufen Bathrooms.